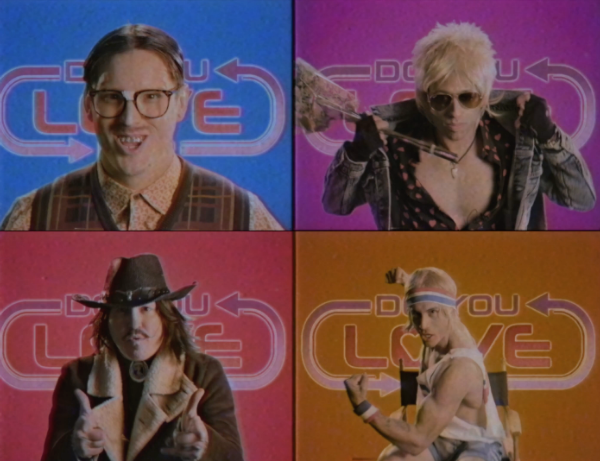 Escape The Fate go blind dating in their new video for ‘Do You Love Me?’, taken from their recent album I Am Human, which is out now via Eleven Seven. Stream HERE. It’s jam-packed from the start with humour and tongue-in-cheek fun, as we witness the band in a spoof TV dating show. Presented by Robert as the eccentric host, four extravagant bachelors – rocker Ritchie Valentine, mathematics genius Walter Wayfeather, gym obsessive Bob Bailer and cowboy Cody Darkwood – all played by the band, are fighting to win the heart of love hopeful Destiny, who’s also played by frontman Craig. The video comes just before Escape The Fate wrap up their UK and European headline tour, celebrating the 10th anniversary of their breakthrough album This War Is Ours. Performing the album in its entirety, they’ll be playing the final show of the run at London’s Electric Ballroom on February 20th. This War Is Ours was their debut record with vocalist Craig Mabbitt, and marked the beginning of a long-standing and remarkable journey for the band that’s seen them loved across the world. The tour was a huge success in Australia in 2018, so the band were ecstatic to be able to bring the celebration to fans at 23 venues across the UK and Europe. Last year, Escape the Fate released their sixth studio album, I Am Human. Produced by GRAMMY® Award-nominated producer Howard Benson [My Chemical Romance, Adam Lambert], this record sees an evolution of Escape The Fate’s sound which brings the band back to the excitement of their roots.